Eight bodies were found Monday on a boat that has been washed ashore on the Sea of Japan coast of Akita Prefecture in northern Japan, the Japan Coast Guard said. The wooden boat, which was spotted on a beach Sunday morning, may have come from North Korea, according to the coast guard. 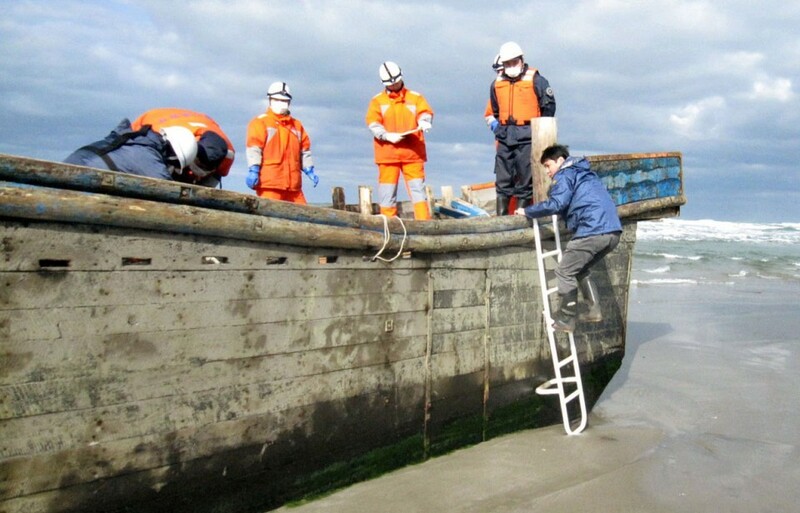 It is the latest discovery of an unidentified boat washed ashore on the Japanese coast in a string of similar recent cases. The boat is different in shape from a North Korean fishing boat that was discovered last week at a marina some 70 kilometers south of the latest case. The boat that washed up last week was carrying eight men and the vessel later disappeared. Police are looking into both cases. The Japan Coast Guard said it had originally found the latest boat afloat offshore last Friday but could not inspect it as bad weather prevented its vessels from approaching. Some bodies have been reduced to bone, it added. A 68-year-old woman who saw the boat Monday morning said rescue workers carried the bodies ashore one after another using stretchers. "I was surprised to see the boat in such a bad condition," she said. Earlier this month, three North Korean men were rescued and seven bodies were recovered from two capsized boats off the Noto Peninsula in Ishikawa Prefecture. In Aomori Prefecture, north of Akita, wooden boats bearing Hangul letters were also found drifting ashore.